As you would expect, the Tech 3 comes in a selection of colours and finishes. 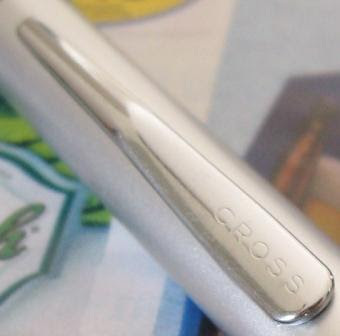 To give my specific model its full and proper name, it is a Cross Tech 3 Satin Chrome Multi-Function Pen, item #AT0090-5C. 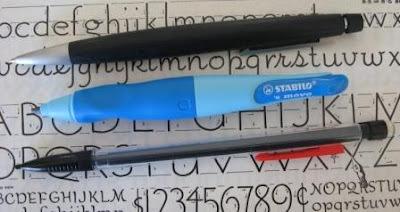 It occurs to me that this blog has been going over three years, and yet this is the first Cross writing instrument to be reviewed. Ahhh, my oversights continue to build! 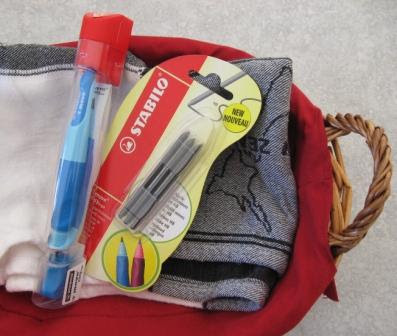 The Tech 3 is fitted with three tip selections – black ballpoint, red ballpoint and 0.5mm pencil. I won’t go into any detail on the ballpoints except to say they are the usual sort of mini cartridges, and write very smoothly and produce good solid lines. Your only quibble will be the size of the ink reservoir. The ballpoint tips are coloured red and black so you know which is which. 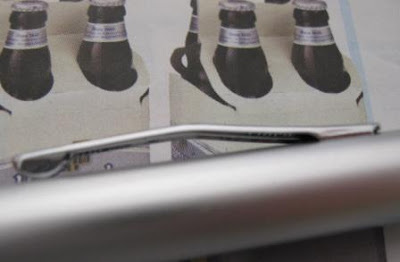 You rotate the lower half of the pen around to push the tips out. 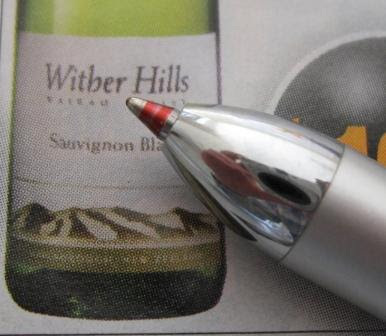 Unlike many multi-function pens you don’t twist left or right for a particular tip. This one is just a continuous twist, you can go round and round in either direction to your hearts content. At first I thought I preferred the directional concept, you know, from the retracted position, left for red, right for black or something like that. However, after a while with the Tech 3 though I think I have been converted to this continuous twist concept - just spinning around as it were. 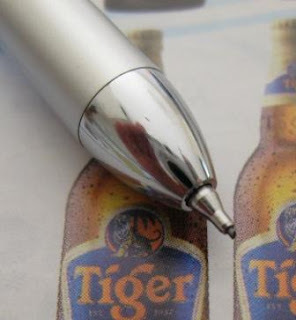 So, let’s select the 0.5mm pencil tip. I have sometimes felt that multi-pens suffered from more lead breakages than normal mechanical pencils, bit I didn’t notice this with the Tech 3. 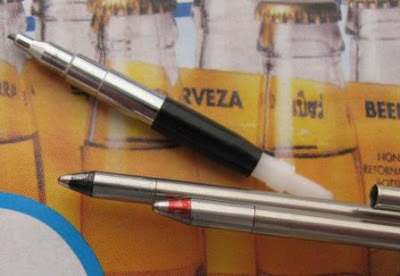 Like most multi-pens the Tech 3 has some tip wobble. No worse than average, but that’s definitely too much for the precise folk out there. I did sometimes hear the tip move against the body hole when I first started to write. The lead advance mechanism is a standard push top ratchet. Like many such multi-pens it is rather laborious and imprecise feeling compared to the nice crisp mechanism that pencil fans are normally accustomed too. Ten clicks will get you about 6mm of lead, which is not a huge amount for a general writing pencil. But then again they maybe more concerned about reducing breakage from over-advancing and so on. 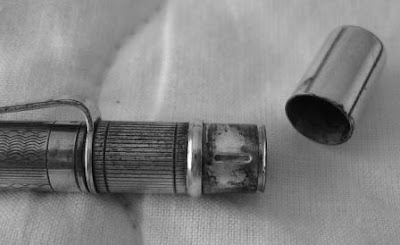 The actual lead sleeve itself is a short cone with final short pipe section. 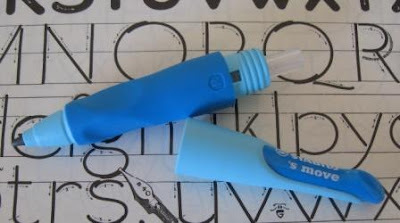 Of course the whole tip retracts when not in use so this writing instrument is fully pocket-safe. There is a small emergency use eraser under the top cap. You have to unscrew the cap to get at it. 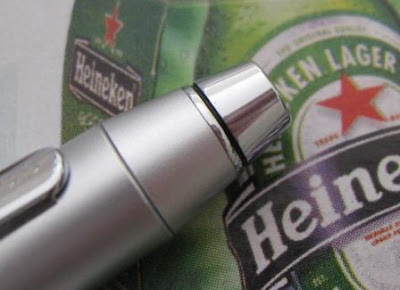 To refill the pencil or replace the ballpoint cartridges you simply pull the top half of the body away from the bottom half to reveal the internals. Then pull the relevant tip off its stalk and replace. For the pencil in between the ripping off and sticking back on you of course shove some leads in the tip and up the stalk. This is where it gets a little tricky. You need to be careful when pushing the pencil tip back onto the stalk that you don’t break any leads. Cross say the Tech 3 is filled with five leads, well I won’t dispute that you can get five leads in there, but personally I’d say you were pushing your luck and I’d only stick two or three in. Unless of course you like a bit of break and jam. There is no specific grip zone or grip enhancements. My satin chrome finish seemed to offer reasonable grip though. 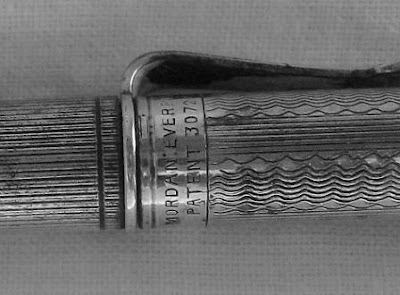 The combination of satin and lustrous chrome trims is pleasing to the eye, and overall this is a fairly nice looking pen. Personally I think the tip is a little bit blunt and rounded, and that they could have done a little better with that part of the styling, but then that’s just my opinion. Obviously the folk who actually get paid to design these things disagree. The Tech 3 is not a heavyweight and is fairly neutrally balanced, perhaps a little on the top heavy side of the line. The pocket clip is the standard Cross design, good sturdy and functional, although not spring loaded. 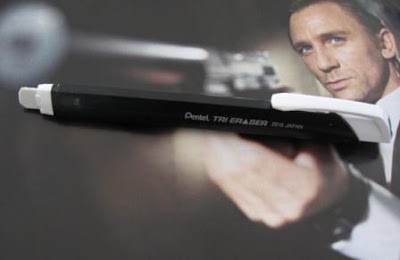 The only marking on the pen is the Cross name on the pocket clip. Overall then, this is a pretty good multi-function pen, and I enjoyed using it, and took the opportunity to use the red and black tips to underline some pencilled notes in meetings, etc. Best Points – Continuous spin to select point. 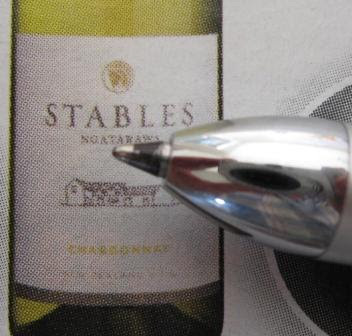 Not So Good Points – Limited ink and lead capacity. Lead advance mechanism is a little laboured. Dimensions – Length 139mm, diameter 9mm at lower body half. Balance point about 75mm up from the tip. I often like to have a themed background in my photos. I was trying to find some suitable backdrops for the Tech 3 but wasn’t having much luck. Then my neighbours turned their stereo up, and inspiration came. Unfortunately I didn’t have any suitable images to use, but I took a couple of shots against screen images that I googled. There’s no prize other than honour and glory (and maybe an empty can of XXXX) for the first person to leave a comment about the relevance of this images to the Tech 3. Sorry to most of you out there, but this quiz is slanted in favour of Aussies and Brits, and of course Kiwis too. Here’s another oldie that’s a little interesting. The metal surface is a bit discoloured in places, and it needs a bit more cleaning. I’m not sure, but I think its nickel. The pocket clip and everything above it winds around to advance or retract the lead. The pocket clip doesn’t touch and clamp onto the metal body, otherwise it would scratch as you wind it round and round. I quite like the mix of plain and engraved parts of the body. 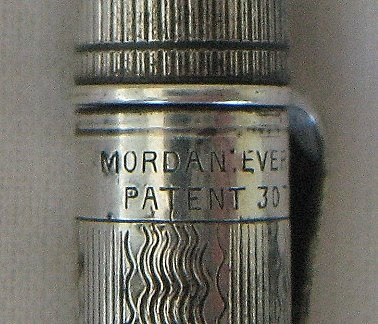 On the body just below where the pocket clip is joined on, it is stamped “Mordan Everpoint, Patent 307227”. You can find this inscription on lots of pencils – usually gold filled or something a little more exotic or expensive than my plain nickel. I presume the patent relates to the mechanism, but I haven’t yet got hold of a copy of the patent. A plain window to allow a personal inscription. There is no lead in the pencil and the correct size is a little bit of a mystery. 1.18mm is too big and 0.9mm is too small, so I presume it is one of those unusual 1mm sizes. Being a collector of anything involves some financial outlay. Luckily collecting pencils, woodcase or mechanical, is generally towards the lower end of the expense spectrum. 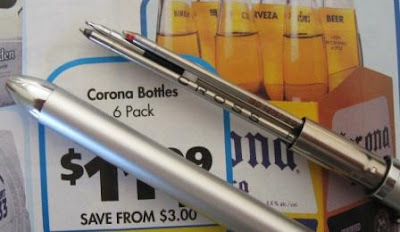 Having said that, you can certainly spend many a pretty penny or two on mechanical pencils. 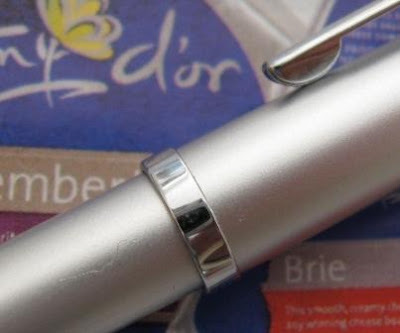 You can easily pay hundreds of US dollars for luxury brand items by the likes of Parker, Caran d’Ache, Mont Blanc and Yard-O-Led. In moments of extreme PAS madness you can also pay over a hundred bucks for used vintage pencils that were not all that expensive in their day. Thankfully for me personally, these hundred dollar plus moments are the extreme exception rather than the norm, and I am taking steps to inoculate myself against them. As any dedicated fan of Antiques Roadshow knows, provenance is everything. A piece of jewellery made by Faberge is tremendously expensive, but if that same piece of jewellery was owned by the Tsarina, then you can slap a couple of extra zeros on the price tag. Similarly there are silver spoons and then there are silver spoons made by Paul Revere. I was recently discussing some historical events and disastrous communication failures with an American friend. In passing he mentioned ‘Jeb’ Stuart and the Battle of Gettysburg as one example. That set some of my lateral thinking cogs awhirl. As they say provenance is everything. So, what then is the most expensive mechanical pencil? Who knows? Think of some possibilities. 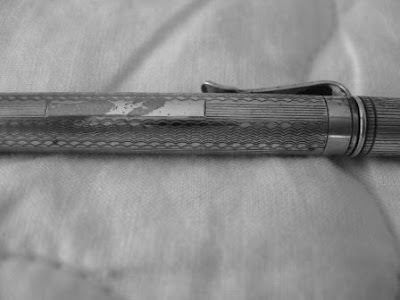 I do know that the most expensive mechanical pencil I know of is the engraved gold pencil owned by the said Jeb Stuart and used to write battlefield orders. Auctioned back in 2006 along with a set of gold cufflinks, pre-auction value estimates were in the vicinity of US$10,000. Maybe one of you belongs to Worthpoint or wants to sign up for a free membership trial and tell us what it actually sold for. Sleek, shiny, black and white. My countries national sporting colours, how could I not like that? Putting my obvious bias aside, I do think it is a fairly good looking item. 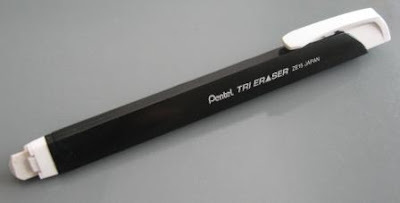 The Tri Eraser has a triangular-ish body, and a triangular eraser core. 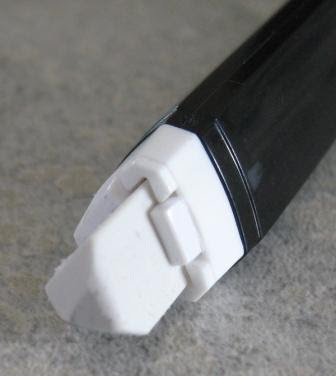 The core sides are about 8mm in length, and the total length of the eraser core is about 122mm, of which about the last 15mm is effectively unusable as its held in the mechanism. The triangular body is quite comfortable to hold, and it certainly isn’t prone to rolling around on your desk. There is an integrally moulded pocket clip on the top section. 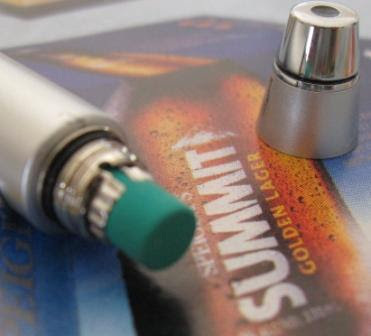 The core is advanced mechanical pencil push top ratchet style by pushing down the white end section. The mechanism feeds fairly well, but not as precisely as a mechanical pencil. Replacement eraser cores are just fed in through the triangular hole in the top of the end section. 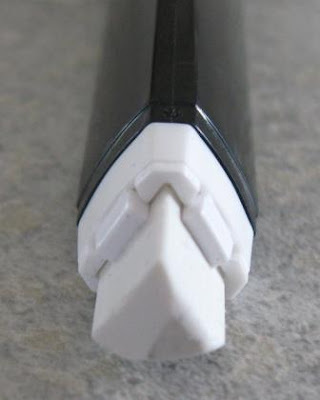 By holding the eraser at about a 45 - 60 degree angle and rotating which side of the triangle you use you can keep some sharpish edges and small sections available to do some detailed erasing. The core is held fairly tightly by the mechanism but if you push down strongly the core will slide back up into the body. This is a bit of a problem if you press down hard whilst erasing as the core can slide back up into the body. 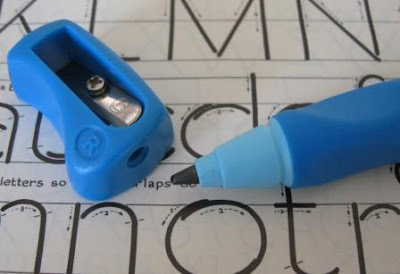 Obviously this is most pronounced when holding the eraser vertically, but even when held at about a 45 degree angle to the paper it can slide back up under heavy hand pressure and vigorous erasing. I don’t want to make more of this matter than is necessary. If you are doing a small to medium amount of erasing, erasing a precise area, etc then you should not have any problems. It is really only if you are erasing a large area with heavy hand pressure that you may run into problems with the core pushing back up into the body. The Pentel website makes no mention of what the eraser core is or isn’t made from, but I found some shopping websites that claim it is latex-free and others that claim PVC-free. It’s clearly not latex but other than that, who knows? I have recently been doing a little Googling on non-latex eraser compounds and from plastics raw materials manufacturer’s sites, research sites, patent websites, etc its clear there are a lot of different non-PVC materials used. EP/PP (ethylene/polypropylene copolymer), styrene-ethylene/butylene-styrene block copolymers, SBS/PS (poly(styrene-butadiene-styrene) blended with polystyrene), and SBR (styrene butadiene rubber) are just some the fancy names you will find mentioned as eraser compounds. It’s also now clear to me that a few of the erasers I have looked at and thought were vinyl probably weren’t. 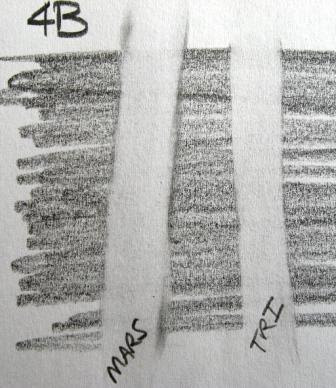 During my review time I felt that the erasing power of the Tri Eraser was reasonable but not exemplary. Certainly I felt that it did not erase as well as my benchmark, the Staedtler Mars Plastic. Being a relatively small core eraser the waste of the Tri Eraser did not tend to twist up into long strands, so I always had a bit of eraser dust to clear up afterwards. On then to the official test, Tri Eraser versus Mars Plastic, with 0.5mm HB grade mechanical pencil lead and 4B grade Staedtler Mars Lumograph woodcase pencil lead. From my preceding comment, I expected Mars to perform better than Tri Eraser on the official test. I was wrong, so I’m not sure where that leaves my original gut-feeling that it wasn’t as good as Mars Plastic. Basically the official test was a draw, both doing an equal job of erasing the HB and 4B lead. There was one difference though, which you can see in the photos. 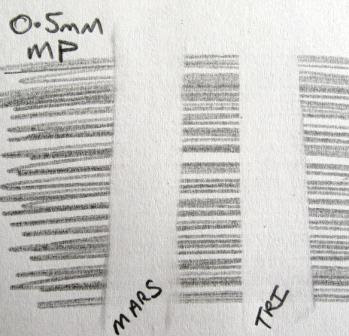 Note how Mars tended to smear the lead more than Tri Eraser. Some might claim this means Tri Eraser actually won the official test! I’m tempted to think this smearing is partly to do with the size of the eraser. The compound of the smaller Tri Eraser rubbing off the main body quicker, thus leading to less smearing? 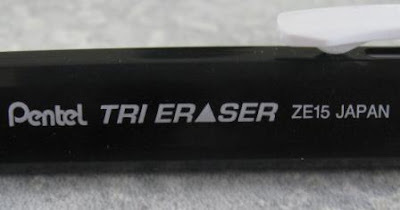 So, I’d suggest you consider the Tri Eraser next time you need something erased. Best Points – Triangular core shape keeps a fine edge. Not So Good Points – The core sometimes sliding back up into the body. Dimensions – Length 125mm, triangle side length 13mm. I started thinking about the pencil industry. Here’s a couple of things that popped into my head. It seems to me that one of the members of the pack is making a bid for the leadership, challenging to be top dog. The Alpha Gel, the Kuru Toga, the Shift, NanoDia leads - Mitsubishi Pencil and their Uni brand seem to be on the move these days, releasing new designs with interesting and innovative ideas, really taking it to the competition. 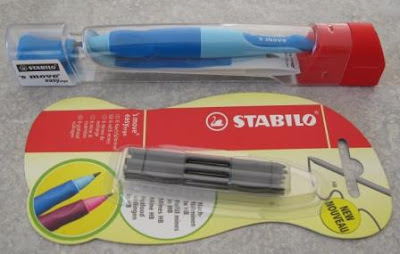 I personally feel that Faber-Castell seem to be concentrating on woodcase pencils, but Staedtler are showing signs of mechanical life with some of the 925 series of pencils and some new products appearing on their international website. Agree, disagree, see some trends yourself? I first saw the ‘s move easyergo over on Lexikaliker about a year ago. Some months ago it started appearing in a few shops that I visited, and a few weeks ago I finally succumbed to PAS and purchased one along with a pack of replacement leads. Let’s get something clear here at the beginning. This review is very different to my normal reviews. It is a pencil designed for young children so my suitability as a reviewer is very questionable. No matter how short or long a time I used this pencil for, I am simply not the intended user and thus my opinions are of even less value than normal. Unfortunately my close family does not include any youngsters within the target demographic so I couldn’t pass it on for a second opinion. The ‘s move easyergo comes in four different versions – left and right hands, and blue or pink. Since I am right handed and a boy, I purchased a blue right hand model. Lets grab hold of the pencil. It’s light. Lighter than I expected for a relatively wide bodied pencil. That’s probably good for children. The grip section is rubberised and has three shaped finger depressions scooped out of it. They are arranged to effectively produce a triangular bodied grip, encouraging your finger placement into a wide and hopefully relaxed grip stance. It’s good, although the encouraged grip stance is a little wider than I personally prefer. Might well be different for the smaller hands of children though. In my opinion Stabilo have done themselves proud with this grip section. (I have put my dislike of rubber grips aside for the moment.) The lead is 3.15mm diameter. No doubt this is because they value strength over fineness when considering young writers, but I’m not so sure that 0.9 or 1.3mm wouldn’t be strong enough. The leads supplied are HB grade and produce a dark line but a rather noisy writing experience. Stabilo supply a lead sharpener with the pencil, so they obviously agree that 3.15mm is too fat to use unsharpened. I just have this nagging feeling that 0.9mm and no sharpener might have been a better option. Teaching youngsters not to try and push the tip through the paper and out the underside of their desk might be a valuable lesson. You might say that 0.9mm is too weak, but 0.9mm unsharpened is similar to the tip of a sharpened 3.15mm lead, or a sharpened woodcase pencil for that matter. I know a few of you readers are teachers, and a lot of you have got children, so put your 10 cents worth in. The lead is advanced by pushing the top section down. It’s not the usual push top button type arrangement – see the picture for an explanation. It is a good strong positive feeling mechanism. Ten clicks will get you about 15mm of lead. You can of course retract the lead back inside the tip for storage purposes. Just how many children will learn that, or remember, or care…well that’s another matter. There is no storage of spare leads inside the body. You unscrew the body to insert a new lead. I am not convinced that the lack of lead storage is a good feature, especially for young forgetful users. “Excuse me Miss, but my pencil doesn’t have any lead.” (Hey, just think of the classical school imagery, not todays ramshackle scenario) There is no eraser, but I imagine young children make so many mistakes that a good block eraser is a necessity. Another thing missing is a pocket clip, but again that’s no issue for children. There is a small bump moulded into the grip section which helps stop the pencil rolling around uncontrollably on your desk, although it still rolls fairly easily. 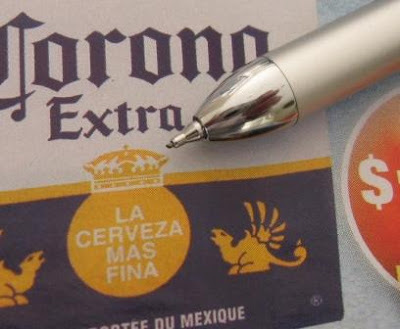 Some small blank self-adhesive name-tag labels are supplied which you can apply to a special recessed section on the pencil. Overall then I think this pencil is well worth checking out next time you are in the market for a pencil for the young folk. Best Points – The grip. Not So Good Points – See below. Dimensions – Length 118mm, diameter 15mm at widest point. Balance point about 50mm up from the tip. 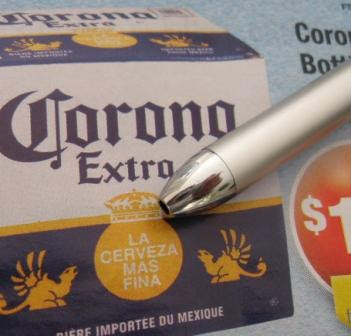 This pencil is specifically marketed as a pencil for young learner writers. 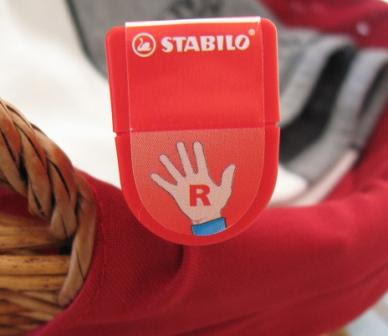 Stabilo’s website states “The target group – children learning to write.” They emphasise its ergonomic design, noting it took a team of researchers and designers four years to design the ‘s move easy range. They have commissioned a glowing ergonomic appraisal of the ‘s move easyergo by the Head of the Institute of Ergonomics/Technical University of Darmstadt. All this, and they name it the ‘s move easyergo. Wow. 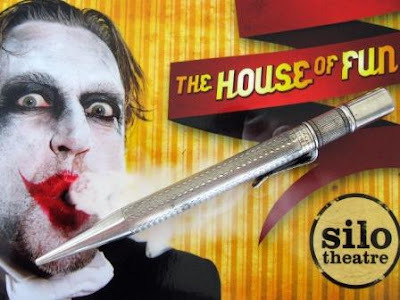 I wonder if it took the marketing department four years to come up with that piece of excrement for a name. 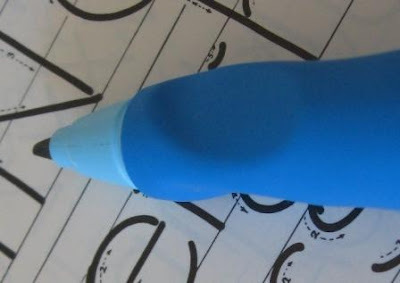 Personally, I would have imagined that a writing instrument targeted at young learner writers would be trying to set an example, but instead they come up with gibberish for a name. Even worse, they can’t keep their gibberish constant. Is it the ‘s move easyergo or the ‘s move easy ergo? I don’t know. You will find both on Stabilo’s website. Please click on the picture below to enlarge it and see just how much They are not amused. 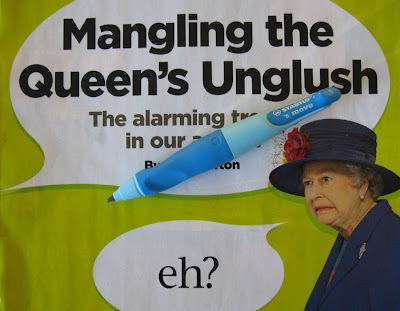 Stabilo, I accuse you of gratuitously mangling the Queen’s English. Now some members of the anglo-sphere may not be totally happy with that Queen’s English reference, so to be inclusive I’ll accuse you of murdering the language in general too. Because you are Germans, and English is not your native language I would normally cut you some slack, but in Germany you still call it the ‘s move easyergo which is just as much gibberish in German as it is in English, so even in Germany they would be thinking "die Sprache verhunzen". 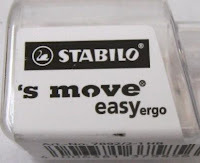 ‘s move easyergo indeed! Stabilo, hang your head in shame.